No Dirt's Andrew Cini knows cleaning inside and out. To say Andrew Cini and his team at No Dirt know how to clean is a massive understatement. The staff at the family-owned-and-operated business have so many cleaning qualifications it’s nearly impossible to list them all. With more than 14 years’ experience, Andrew leads No Dirt Restoration Services’ war on mess. “Our training is extensive and with a network of mycologists, hygienists, chemists, suppliers and the best restorers in this industry we get results,” he says. Flooding, smoke and fire damage, contamination, mould, Andrew has seen it all. With a simple property or asset inspection he can help control or correct indoor environmental issues. “I can guide you and your family or staff toward achieving a healthy environment,” he says. With a combined 50-plus years’ experience, there’s almost nothing Andrew and his team can’t clean, from carpet and upholstery to walls and ceilings. And from 2015 to last year No Dirt invested more than $350,000 in new, state-of-the-art equipment and vehicles to further improve its service. 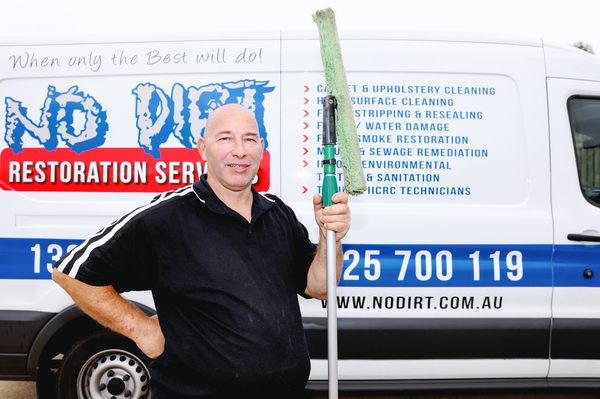 No matter how dirty or mouldy the site, the staff at No Dirt will do their upmost to make it squeaky clean. “You get knowledge, quality service and, most importantly, results,” Andrew says.